I'm having a great time at the Lucca Comics and Games show. 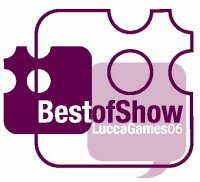 It didn't hurt at ALL that Chez Geek (published in Italian by Raven) won the Lucca Games "Best of Show" award for Best Card Game of 2006. This is THE big award for Italy. Happy indeed! Congratulatsions to Raven, to designer Jon Darbro, and to illustrator John Kovalic.